Having already discussed the overall fluff and aesthetics of the book, the HQ choices, and a bit on the Wave Serpent, we now turn to Part 4 of my review of the 7th Edition Craftworld Eldar book, focusing on the troops choices available to aspiring Autarchs everywhere. The first thing is to note what’s missing. As the Spiritseer lost their ability to make Wrathguard and Wrathblade units Troops, they can’t really be considered part of this section, and outside the use of some formations (which we’ll discuss later), the era of the Wrath-only army is over, unless there’s a reworking or major FAQ of the Iyanden Supplement. So how about the troops that are left? Guardian Defenders. Guardian Defenders remain the same points cost, and have roughly the same role as they always have – cheap troops who die like chumps to anything with AP 5, but have really nasty, if short range, guns and access to mobile heavy weapons platforms. Despite being civilians, they remain BS4, the average Eldar poet naturally being roughly as good a shot as a combat veteran or Space Marine. As the Warlock Conclave can’t carve off members of its unit to attach to Guardian squads anymore, they now have a 35 point Warlock Leader upgrade (40 pts. with a Singing Spear). Capable of being taken in squads of 20, they can also take a Heavy Weapon Platform for every 10 models, potentially giving you a unit with 23 models in it, which is…considerable. The weapon options also remain the same, with the Eldar missile launcher representing both the most expensive and most versatile option. However, the EML now automatically comes with the “Starhawk” missiles as well, giving you an option to embed a lot of Skyfire missiles in your units, though at a pretty considerable price. As with the last edition, Guardian Defenders can take a Wave Serpent. Contrary to last edition however, it’s not necessarily a clear auto-take, because you’re not sneaking your main battle tanks into the Dedicated Transport slot. That being said, Wave Serpents are still excellent transports – they can shield Guardians from the kind of firepower that simply tears them apart (Space Marines, Dark Eldar, anything better than a Guardsman…), get them to objectives faster, and generally act as a fire support platform. Additionally, if taken as a Dedicated Transport as part of a CAD, the Wave Serpent is Objective Secured, and there’s something to be said for an AV 12 Skimmer madly jinking on top of an objective, with the potentially to put out a lot of S6 firepower one turn as an objective holder, especially as Maelstrom missions become more important. I no longer think the Wave Serpent is an auto-take, especially if you’re trying to keep your troops units cheap, but it’s hardly a terrible choice even with the redesign. Storm Guardians. If you find yourself looking at your WS 4, S3, T3, 5+ Armor troops and going “You know what? These guys need to get into close combat!”, Storm Guardians are for you. Appropriately armed for the task, just like the Guardian Defenders they can take a Warlock in the unit as well, and can get to a unit of 21 models if that’s your thing. As with the last edition, you can slip two flamers or fusion guns into the unit, as well as two power swords, though this starts making your Storm Guardians pretty expensive for what they do. Their formation makes this considerably less expensive to do, through it still doesn’t resolve the essential problem of being S3 and T3 in close combat with next to no save. To be blunt, I’ve never seen a unit of Storm Guardians fielded on the table. I don’t know that I ever will. Rangers. The cheapest of the troop options, Rangers remain their sneaky, sniper selves. They’ve swapped out Stealth for Shrouded, which is nice if there are other rules giving out Stealth (i.e. Night Fighting). They’re useful for infiltrating, holding objectives, and otherwise being a cheap, throwaway nuisance, but I wouldn’t expect miracles of them – I can count the number of games where I thought “Man, I’m glad I brought my Rangers…” on one hand, and would still be able to do so after a serious industrial accident. On the other hand, for 60 points for 5, they’re hardly going to break the bank, and if they hold an objective long enough to collect 1 VP they’ve probably earned their keep. Dire Avengers. The troop Aspect Warriors, Dire Avengers will give us a preview of things to come for the other Aspect Warriors who will be reviewed in a later post. They remain the same cost, and have the same statline, save that the Exarch has picked up an extra wound and Battle Fortune, granting the Exarch a 4++, which is nice. They have replaced Counter-attack with Defensive Tactics, which allows the unit to choose either overwatch at BS2 or Counter-attack and Stubborn. This is huge. Consider the graph below, of 2500 simulated games of a unit of 5 Dire Avengers firing a turn of overwatch at BS1 vs BS2. As with the graphs in the Wave Serpent analysis, purple is the old 6th edition Codex, and the light blue is the new 7th edition codex.  As you can see, firing at BS1 means a large percentage of the time your overwatch will do absolutely nothing (~16% of the time) and about half the time you’ll get one hit at most. 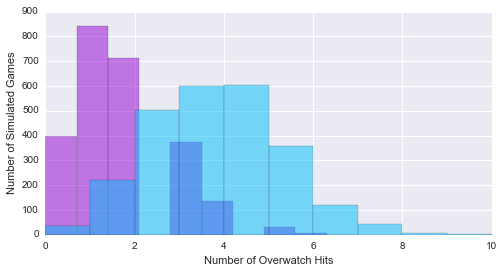 Contrast that with the blue distribution – doing absolutely nothing is now an extremely rare outcome, and you can consistently expect somewhere between 3 and 5 hits from overwatch. 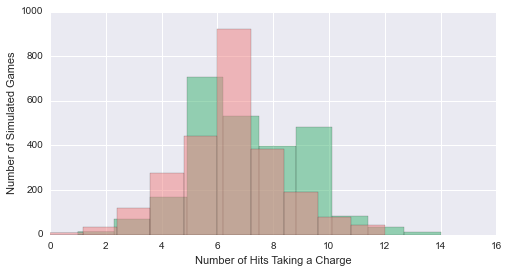 Here, the green distribution is the number of hits when overwatching at BS2 followed by 6 close combat attacks, and the pink is overwatching at B21 followed by 11 close combat attacks. Generally, I’d argue that the better overwatch is the superior approach – you’re less likely to do nothing, more likely to put in a significant number of hits, and more of those hits are coming from a Shuriken Catapult, which is higher strength, AP5 and has Bladestorm for those precious auto-wound, armor ignoring attacks. Even with a close combat focused Exarch (say, with a Dire Sword), losing that one extra attack is probably worth it for more hits before combat really happens. And it will absolutely be worth it if you’re expecting to take casualties from I10 Hammer of Wrath hits, or are fighting higher initiative opponents. The ability to have Stubborn is nice, and it might be worth it if you think you can survive the charge, but are expecting to lose and need not to run, but in my opinion the best way to survive a charge is to kill the other guy before he hits. Which brings us to how to equip the Exarch. The twin-linked Avenger Shuriken Catapult is a nice bonus for Exarchs expecting to do shooting and taking charges – a couple rerolls are nice in overwatch, though in normal shooting, BS 5 is solid enough to not really need it. The power weapon and shuriken pistol gives a little bit of close combat strength with the extra attack (bringing the Exarch to 3) and AP3, which will make him more dangerous to marine-equivilents, while the rest of his squad definitely struggles vs. troops with decent saves. But you lose a fair amount of range and a shot – it’s a bad idea for a fire support Dire Avenger squad. The Diresword and pistol combination is an interesting one. Again, he gets an extra attack, and they’re now at AP2, though only S3. But Soulrazor as an ability forces the opponent to take a leadership test for each unsaved wound, or be removed from play. That’s a very interesting combination if you’re using a Dire Avenger exarch to soak challenges, or fighting middling-poor leadership but tough troops (Orks). Finally, there’s the option to take a Shimmershield and power weapon. This gives the whole unit a 5++ save at the expense of all shooting from the Exarch. I’d only consider this if you’re planning to use your Dire Avengers as a speed bump of some sort, and even then, a 5++ probably won’t slow anything down. While it has been nice from time to time to go “No! I totally do get saves from that…”, if you find yourself in that situation, odds are most of your Dire Avengers are still about to die. Finally, Dire Avengers can take a Wave Serpent. In the last edition, you took the Dire Avengers because it was the cheapest way to get a Wave Serpent. This edition…I think you take the Wave Serpent because of the Dire Avengers. I’m fairly excited about the idea of large-ish units of Dire Avengers mounted in Serpents. I think a role for Dire Avengers is as a close support but non-close combat unit. A largish unit of Dire Avengers, rolling in with a Wave Serpent, will do a number on essentially any unit of infantry, and it will be a tall order to counter-attack them off it. It’s at least something worth trying out, beyond just the 6th edition “Dire Avenger tax” on a Serpent Spam army. Windriders. One of the units that the recent internet uproar has been over, stemming from a small but extremely significant change. Overall, the jetbikes have remained the same price, and have the same basic concept behind them – an extremely mobile, slightly more durable platform. Like the Guardian squads, they now can get a Warlock attached to their squad as a sergeant-like upgrade. They also got an updated new look that makes them look much more aggressive and streamlined, and much more in line with the Dark Eldar bikes – which is wonderful, as while I settled on a jetbike conversion I liked, it involves stalking Ebay for bits, and that’s a touch tiresome. But the major change comes in the form of the heavy weapons – now not only can they now take either Shuriken Cannons or Scatter Lasers, but rather than one for every three bikes, it’s available for every bike for 10 points a model, making each jetbike potentially a very fast Strength 6 weapons platform for 27 points a model. This, clearly, is a big deal. As I mentioned in a previous post, one of the popular competitive builds for the Eldar was built on lots of mobile S6+ shooting in the form of reliably twin-linked Wave Serpents. But that had been much reduced. So what is the long ranged, non-Ghost Eldar army to do? Fill in the gap with jetbikes! How many jetbikes? As we can see, the addition of an additional scatter laser more than makes up for the weaker Wave Serpent. Now, there are some subtleties to this, like some of those old Wave Serpent shots being S7, meaning the “old style” version is marginally capable of dealing with threats like Imperial Knights and other AV 13 threats, while the new version is utterly helpless in that regard – so it may need those additional hits if firing at vehicles. But it requires only a single bike to make up for the Wave Serpent redesign. With one-in-three heavy weapons, that’s a 61 point penalty to restore that firepower…with the new ability to take a heavy weapon with every jetbike, it’s really only a 27 point penalty. There’s no slack in terms of needing to take extra bodies. What is all this getting to? The new jetbikes are good. Very good. Potentially one of the best units in the game right now, combining mobility and firepower in a very efficient package. There are however some caveats to this. In my experience, jetbikes are not particularly durable. For Eldar they’re tough, but they’re only T4 and 3+ armor units – they’ll die as easily as Space Marines, and are considerably more expensive for it. And jinking if they’re taking AP 3 or better fire will rob them of most of their firepower. They’re also rather large models – there’s been a lot of talk about being able to just pop back behind cover with their assault move and remain free from harm. In my experience that’s very hard to do with anything other than minimum sized units. Finally, I’ve found that jetbikes are either survivable or mobile, but rarely both. Turbo-boosting means they’ve just paid 10 points to not shoot, and getting in the enemy’s face exposes them to fire. Generally, the units are small enough that small skirmish units and the like can engage them and still do damage. When they crumble, they start crumbling fast. Adding Warlocks helps them considerably, but this also makes the unit more expensive. While they may match the firepower of old-style Wave Serpents, I doubt they will be able to persist with nearly the tenacity of the grav tanks. Deep striking troops, drop pods, and other weapons that can haul the initiative back to the side of the windriders’ opponent will, I suspect, represent major threats. Letting them sit around in the backfield and hammering away without pressuring them is a recipe for disaster, but this is hardly a new concept for the Eldar – or several other armies. All in all, the Troops section of the Codex is as good as it’s ever been. There’s a core of Guardian-type troops that can make a competitive build – in this case Windriders rather than Wave Serpents – and some tempting options elsewhere in the Codex. I believe the Wave Serpent still represents a solid transport, acting as a transport and mobile base of fire for Guardians, and an element of a “Shock and Awe” attack with Dire Avengers where the fact that the Wave Serpent isn’t an assault transport shouldn’t matter. I’ll likely be taking less of them, but the loyal Wave Serpent will remain a feature of my army.